The popularity and success of the Maserati Merak is not only attributed to its eye catching exterior design. It had a lot more to offer with regards to auto interiors. Much of the features of the Maserati Merak came from its big brother the Maserati Bora and the Citroen SM, from Citroen the sister company of the Maserati. The Maserati Merak was launched in 1975 as the junior model of the Bora, a bigger and more powerful Maserati class. It was designed when Citroen, its sister company was still a major force having shares in the Maserati Automobile Company. During the particular period, the timing was just right to release a medium-sized, luxury sports car which is relatively more affordable than the previous Maserati models. Automotive enthusiasts believed that the more affordable Maserati Merak was the right choice, especially during the time when the globe was stricken with the energy crisis. Being a mid-sized sports car, the Merak did not guzzle that much fuel compared to its bigger counterparts. Even with its great success highly attributed to a relatively affordable price tag, the Maserati Merak did not shortchange motorists when it came down to features. The Merak was a great ride being highly maneuverable and considerably powerful. Making use of some Citroen parts, it produced a respectable 220 horsepower of torque. With its lighter frame, it can reach top speeds of over 150 miles per hour. Now if that is not good enough, I don’t know what is! The Maserati Merak’s dashboard was also borrowed from the Citroen MS but the main thing to note is the lavish leather interiors. At that time, the leather door trimmings meant big bucks baby! This greatly added to its already comfortable bucket seats and a middle console where the automatic window controls can be easily accessed. With all these highly accessible features, great drive and unmatched front and side window visibility, the Maserati Merak was indeed a force to reckon with. A bonus feature of the Maserati Merak comes with its relatively smaller engine. Since the body and shell used for the Merak came from its big brother, the Bora, this offered extra space in the car. This allowed for a more spacious leg room and even a back seat, a feature that most sports cars cannot offer! Although quite small, the back part of the Maserati Merak can fit children and even smaller-framed adults. In 1973, Maserati only manufactured 430 Meraks to sell internationally. This made the latter models quite rare and highly valued. 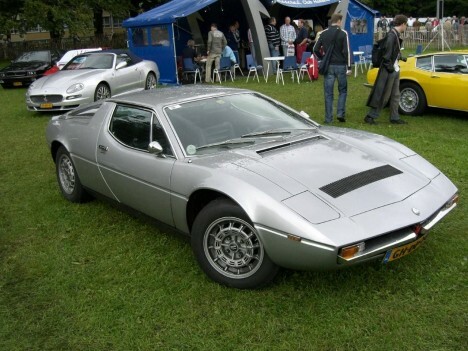 However, around four years later the Merak 2000, another version of the Maserati Merak, was released in 1977. This newer model was already a stand-alone Maserati produce where Citroen already disassociated from Maserati during the late 70’s. With its significantly larger V6 engine, it was only legalized in Italy much to the disappointment of Maserati enthusiasts around the world.